Request a quote for a bulk order for MycK323ac polyclonal antibody. Please fill out the form here below. Your local sales account manager will get in touch with you shortly and send you a quotation based on your requirements. Polyclonal antibody raised in rabbit against Myc (v-myc myelocytomatosis viral oncogene homolog) acetylated at lysine 323 (MycK323ac) using a KLH-conjugated synthetic peptide. PBS containing 0.05% azide and 0.05% ProClin 300. 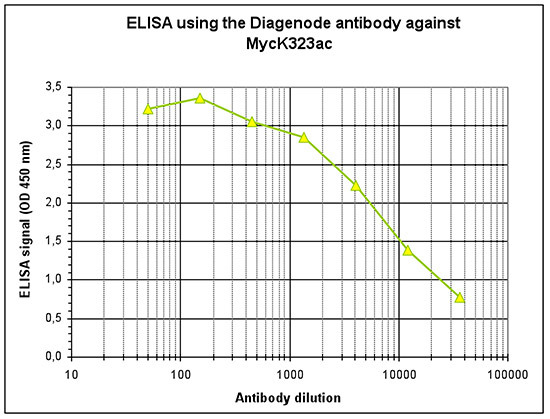 To determine the titer of the antibody, an ELISA was performed using a serial dilution of the Diagenode antibody directed against human MycK323ac (Cat. No. C15410346). The plates were coated with the peptide used for immunization of the rabbit. By plotting the absorbance against the antibody dilution (Figure 1), the titer of the antibody was estimated to be 1:8,000. HeLa cells were stained with the Diagenode antibody against MycK323ac (cat. No. C15410346) and with DAPI. Cells were fixed with 4% formaldehyde for 10’ and blocked with PBS/TX-100 containing 1% BSA. The cells were immunofluorescently labeled with the MycK323ac antibody (middle) diluted 1:500 in blocking solution followed by an anti-rabbit antibody conjugated to Alexa488. The left panel shows staining of the nuclei with DAPI. A merge of the two stainings is shown on the right. Diagenode strongly recommends using this:	MycK323ac polyclonal antibody (Diagenode Cat# C15410346 Lot# A506-0041). Click here to copy to clipboard.